The most popular food holiday of the year is nearly upon us. And that means high anxiety or gustatory bliss. Here in Raichlandia, we practice a 12-step program—12 simple tips to boost your T-Day performance. From our barbecue family to yours, we wish you a happy and healthy Thanksgiving! Heritage breed birds have great flavor (not to mention trendy cache), but can cost double, or even triple the cost of the Broad Breasted White that has become emblematic of American Thanksgivings. If you do invest in a heritage breed, it’s very important not to overcook it. Take it off the grill or smoker when the thigh meat reaches 160 degrees on an instant-read meat thermometer. If you have acquired a frozen bird, be sure to thaw it properly. The safest way is in the refrigerator. Allow one day for every 4 pounds of turkey. If pressed for time, fill the kitchen sink with cold water and submerge the turkey, still in its wrapper. Change the water every 30 minutes to keep the bird cold. Allow about 30 minutes per pound. Never thaw a turkey in hot water or at room temperature. And don’t forget to remove the giblets from both the main and neck cavities of the turkey before roasting. Yeah, I know this sounds obvious, but it’s easy to forget the neck cavity. The USDA no longer recommends washing raw turkey or other poultry under cold running water as the raw juices can travel up to 3 feet and contaminate your kitchen. Amp up the juiciness of your bird by brining, injecting, or slipping seasoned butter under the skin. Do not, I repeat, do not stuff your bird before smoking or grilling. For starters, the stuffing steams rather than browns. And it’s hard to bring your stuffing up to a safe 165 degrees without overcooking the breast meat. Instead, pile the stuffing in a disposable aluminum pan and smoke-roast it at 350 degrees for about an hour. Great flavor and better crust. If working on a standard kettle grill, you can increase the clearance between the lid and the turkey breast by using the metal ring that came with your rotisserie. In my book, smoke-roasting is the best way to cook a turkey. The turkey takes on a subtle smoke flavor, but because you’re roasting at higher temperatures (325 to 350 degrees), the skin gets crispy. 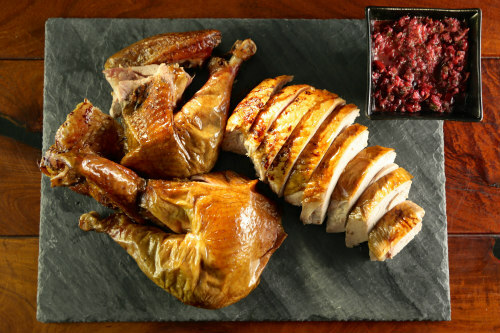 A turkey smoked from start to finish will have tough, rubbery skin. While you’re at it, smoke turkey broth alongside the bird to use in the gravy. If the bird is browning too fast, loosely cover it with aluminum foil. 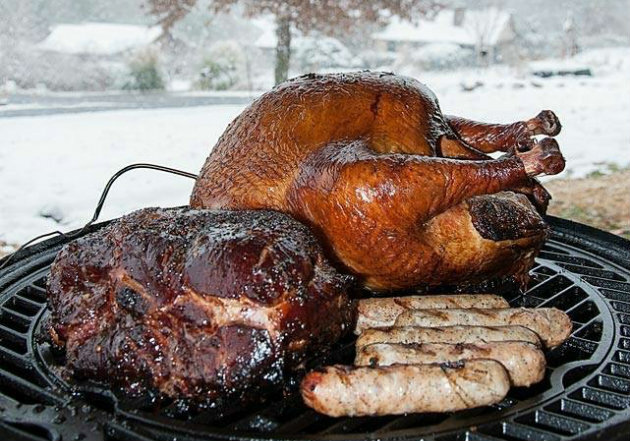 Have a plan in place for transferring the turkey from the grill or smoker to the kitchen. Insulated food gloves or meat claws are a huge help. Or you can run a clean wooden dowel through the main and neck cavities and enlist the help of a second person to help you carry it. Allow the turkey to rest for at least 15 minutes before carving it for maximum moistness. Finally, we’d like to see photos of YOUR Thanksgiving masterpieces. Please post them on the Barbecue Board or on my Steven Raichlen Facebook page.